RBTH presents a selection of views from leading Russian media on international events, featuring analysis of the results of the G20 summit in Brisbane, Australia, and a update on the situation surrounding the delivery of two French-built Mistral warships to Russia. Moscow’s dialogue with its European partners on the Ukraine issue has once again failed, the Vedomosti business daily says, while the main outcome of the G20 summit is that Russia’s isolation from the West is growing. According to Charles Austin from the Chicago Council on Global Affairs, the most important talks for Moscow were those with Merkel, who is setting the tone in European diplomacy. It was important for Putin to put his position across to Merkel and to discuss the threat of new sanctions being introduced. But the dialogue failed, Austin points out, and there was no point in Putin staying till the concluding ceremony, leading to the Russian president’s departure from the summit before the adoption of the final communique. Shaun Bower from the University of California told Vedomosti that Putin’s bilateral meetings had resulted in a further cooling of relations with the West due to the Russian president’s unyielding position. The Nezavisimaya Gazeta daily also points out that criticism of Russia over its role in the Ukrainian crisis became the leitmotif of the G20 summit. Observers agree this was the reason for Russian President Vladimir Putin’s early departure from the summit. At the G20 summit, Western leaders once again condemned Russia for supporting militias in southeastern Ukraine. At the same time, there was no announcement of new American sanctions: U.S. president Barack Obama believes that “so far the sanctions already in place are proving very effective.” The Europeans, on the contrary, are planning to introduce tougher sanctions: German Chancellor Angela Merkel said the EU intended to expand the blacklist of individuals subjected to financial sanctions, while UK Prime Minister David Cameron supported her stance, the paper writes. 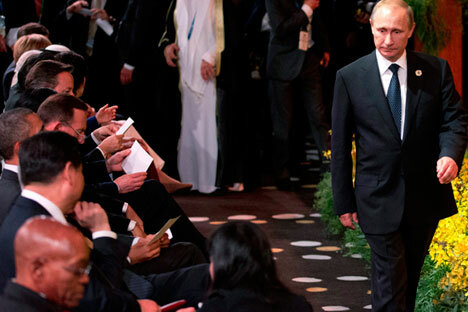 “Putin knew that he was flying into a cage of tigers, some of whom – India, China, Brazil, South Africa – would be more or less friendly towards him, while the others would be bent on, in a consolidated effort, forcing him to accept the rules of the game that are characteristic of the Western world,” Igor Bunin, head of the Center of Political Technologies and a PhD in Political Sciences, told Nezavisimaya Gazeta. Having said that, back in the summer, despite Russia’s actions in Crimea and the armed conflict in the Donbass region of eastern Ukraine, Francois Hollande made assurances that the Mistral contract will be fulfilled, the paper recalls. However, since the start of the fall, the French president has clearly found himself under pressure from his allies – the U.S., Germany, Poland, the Baltic states – who are urging Paris not to hand over the ships to Russia. It was ahead of the NATO summit in September that Hollande for the first time announced that the helicopter carrier would not be delivered by the deadline earlier agreed. The situation that the French president has found himself in presents him with a choice between two unattractive options, Kommersant points out. On the one hand, if Mistrals are delivered to Russia, in the current circumstances it will look like a triumph for Moscow. On the other, the French government appears to have made a mistake by attaching so much political significance to this contract instead of quietly carrying it out. If the contract is not carried out, it is quite possible that Russia will take France to court to get compensation, which could become a painful blow to the French economy, which is not currently in great shape, the publication concludes.